The conference runs over five days with a wide range of open source presentations, labs, and keynotes. This year, we had a number of local, regional, and international Red Hat presenters, more details of which can be found on the Red Hat Community page. Unlike other more commercial Open Source conferences, keynotes are selected by the conference team and aim to inspire, rather than push the products or focus of the top-tier sponsors. I highly recommend the session by Genevieve Bell, plus anyone with an interest in community will appreciate Jono Bacon’s talk on Community 3.0. Jono is now a regular contributor to Opensource.com. With the breadth of content running across five sessions, hallway tracks, social events, and birds of a feather sessions it isn’t an easy event to write up. I’ll present a perspective on sessions I attended, or heard good feedback on and intend to catch up on video later. I also suggest taking a look at the blogs of Rodger Donaldson and Simon Lyall, who regularly attend LCA and provide a great deal of coverage of the conference, amongst others. In addition, Jonathan Corbet from Linux Weekly News is a regular attendee and you’ll find numerous articles over at LWN. There is a bit of an linux.conf.au tradition that a newbie introduction session, plus a speaker briefing, are held on the Sunday afternoon before the conference. 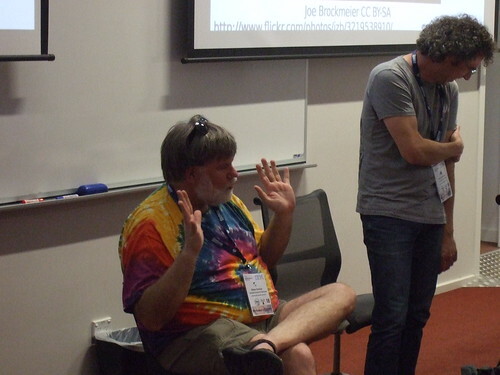 Normally Rusty Russell runs the newbie session but this year he was awaiting the arrival of his latest offspring, so Bdale Garbee and Hugh Blemings (the new Linux Australia President) stepped in. My personal focus was the "Open Cloud Symposium" in Costa Hall, where I was also speaking on ManageIQ that afternoon. Casey West from Pivotal gave two talks that weren’t Pivotal- or CloudFoundry-specific and I highly recommend them for anyone working around DevOps or containers. The Live Migration of Containers session was a touch LXC/LXD-specific and several people wondered why you’d bother, given the service driven approach to container workloads. 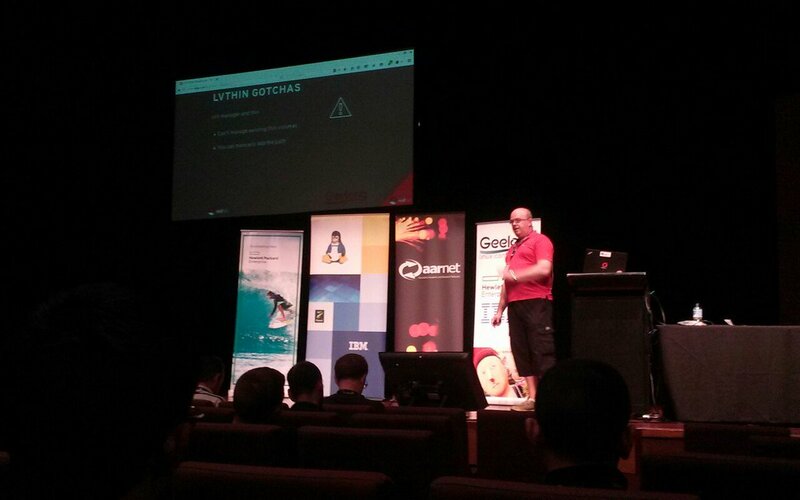 Thanks to Zac Dover for running the Documentation Mini-Conf and the large number of Red Hatter’s who attended from Brisbane. It helped to balance up the Rackspace presence in the room. 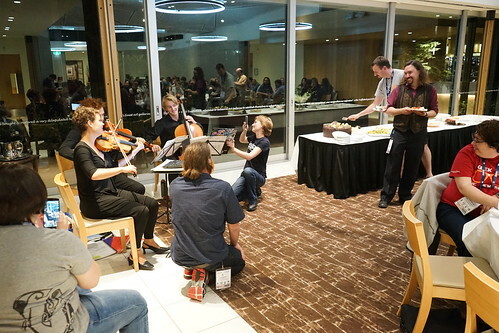 There was a new Open Source and Bio-informatics mini-conf this year that gathered a lot of interest, and I might try and catch some of their sessions on video at a later date, based on feedback. Monday closed with the Linux Australia AGM, where their recent election results mean a 4:3 ratio in favor of females on the council (including my wife Cherie). After an interesting keynote from George Fong, my focus was the System Administrator Mini-Conf, which has been running for over 10 years as part of LCA. Is that a data-center in your pocket? Tim Serong from SuSE gave a 101 session on Ceph, and I sadly missed Jamie Bainbridge’s session on Network Performance Tuning which had terrific feedback. A special mention for Eric Burgueno from Plant and Food Research, a Red hat NZ Customer, who talked about his operational challenges. Fraser Tweedale ran a functional programming mini-conf. The day finished with the Professional Delegates Networking session out at Little Creatures Brewery. Great to catch old friends and make new ones. 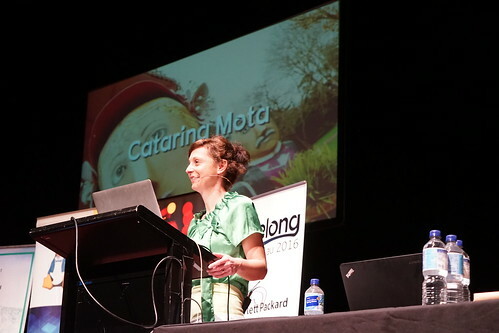 Quite a different keynote from Catarina Mota started our day, including how to build an Open Source House, before we dived into the main conference program. This year the Papers Committee had 300 submissions for the 75 slots spread across five streams, so the pedigree of talks is generally very high. Using Linux features to make a hacker’s life hard Kayne Naughton was a terrific presenter and a great one for anyone who deals with security. Adventures in OpenPower Firmware Stewart Smith is a great speaker and having Linux as your firmware to bootstrap Linux on Open Power is simply awesome. Plus I’m a bit of a Power and PowerPC geek. Improving thread synchronization in GlusterD (Daemon for Gluster) using Userspace RCU (Read-copy-update) by Atin Mukherjee. No video online yet, and one for serious Gluster fans. Melvin: A new implementation of LVM in Rust. Spent a lot of time hacking on LVM so this was really interesting, plus Andy Grover covered the reasons on why you’d implement this in Rust. What Happens When 4096 Cores All Do synchronize_rcu_expedited? 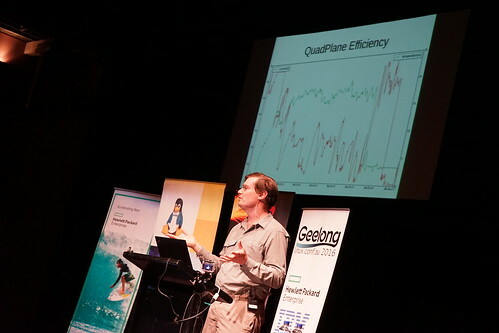 Especially for HPC fans and Paul is a fantastic speaker. 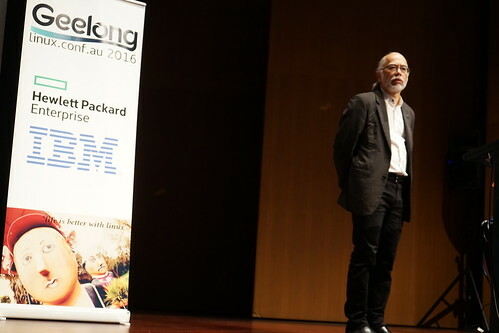 Welcoming Everyone: Five Years of Inclusion and Outreach Programmes at PyCon Australia One I’d recommend to any current or potential conference organisers. Tutorial: Identity Management with FreeIPA Follow up on Fraser Tweedale’s FreeIPA talk from last year. 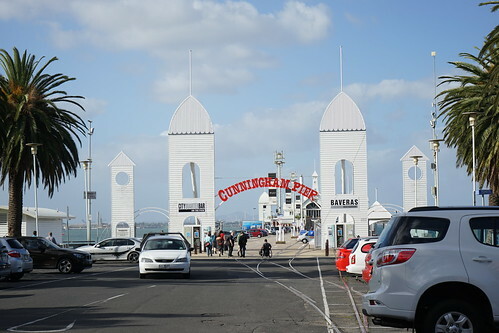 The day ended with the annual Penguin Dinner at the end of Geelong’s Pier. A great opportunity to socialize and network over dinner. Jono Bacon last attended linux.conf.au back in 2007 in Sydney, which was my first LCA. 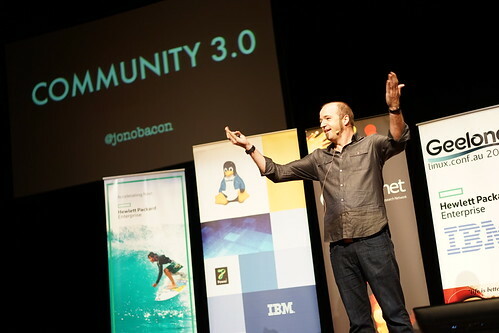 I’ve bumped into Jono at various conferences in the US since then and I have to say his Keynote on Community 3.0 was one of his best. As former community manager at Canonical, and current Director of Community at GitHub, he presented his perspective on how we should be building and maintaining communities today. Overall, this was a hard day due to numerous conflicting sessions. Using Persistent Memory for Fun and Profit Ultimately not something I need in my day job, but very interesting issues when dealing with RAM than can persist like Flash. Dropbox Database Infrastructure Tammy Butow is very energetic and passionate about her role at Dropbox. Some useful nuggets on how they manage and scale their backend. Builds, dependencies and deployment in the modern multiplatform world Looking at a different approach from RPM and Software Collections in managing application dependencies. Open Source Tools for Distributed Systems Administration Elizabeth Joseph is an incredibly well respected Sys Admin running the Open Stack build infrastructure. Record and replay debugging with "rr" Robert O’Callahan from Mozilla provided some awesome quote worthy moments, and terrific content for testers and developers. Playing to lose: making sensible security decisions by assuming the worst Tom Eastman is a great friend and a terrific public speaker. Not just for security specialists, all developers and operators should take a look at this talk. Thursday also featured the Jobs BoF during afternoon tea, where together with Nick Coghlan, we promoted the currently open roles in Australia and Globally. There was quite a lot of interest with a number of one-on-one follow up conversations. Tutorial: The Power of Open Data with ELK Elastic came back as a sponsor this year and this session on ELK was recommended by a number of fellow attendees. Hardware and Software Architecture of The Machine Regular LCA presenter Keith Packard is always watchable, and this session had a number of jaws dropping. Linux driven microwave A lot of great feedback, and a bit of IoT in practice—just possibly don’t do this at home. Machine Ethics and Emerging Technologies Paul Fenwick is another crowd pleaser and one to watch. What I’ve learned as the kernel docs maintainer Jonathan Corbet seldom disappoints as a speaker. 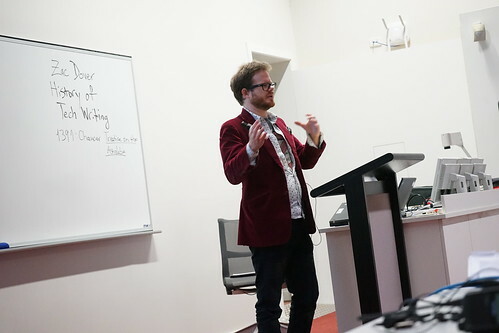 Speaking their language: How to write for technical and non-technical audiences Great to see Rikki Endsley join us in Geelong this year, and I hope she returns despite the lack of warm water at her accommodation. Computer Performance Microscopy with SHIM Not a talk I was going to see, but very highly recommended by a couple of attendees. The day finished with the Speakers Dinner for main conference speakers, where I believe a couple of the speakers persuaded the strings to "Rick Roll" the event, and also play The Rains of Castamere. 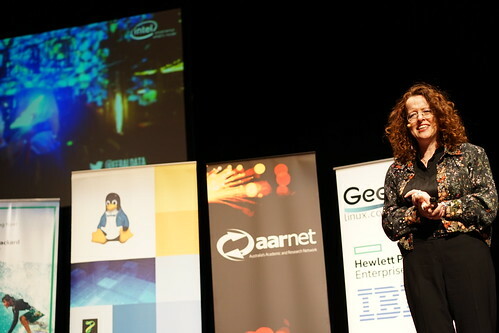 By this point if you haven’t paced yourself then you’re likely to miss the opening keynote, which would be a shame as Genevieve Bell (Intel Fellow and cultural anthropologist) was simply amazing and totally engaged her audience. A key part of her role is to help Intel better understand their customers. I particularly liked the part where she decided to treat her team at Intel as another "Tribe." Friday, like Thursday, had multiple session clashes, so the is plenty for me to catch up on later. Helicopters and rocket-planes Andrew Tridgell could read the Yellow Pages and give an interesting and inspiring talk. Sadly, I missed the end as I had to jump on some customer calls. Copyleft For the Next Decade: A Comprehensive Plan I’m so pleased we brought Bradley Kuhn to Auckland for last years conference as again his talk on GPL and Free Software was a highlight of the conference. Anyone and everyone in Red Hat should watch this session as well as last year’s. Considering the Future of Copyleft: How Will The Next Generation Perceive GPL? Troublesome Privacy Measures: using TPMs to protect users Former Red Hatter Matthew Garrett is always interesting as he relates the pain of his most recent work. The potential of using TPM in conjunction with OTP to validate the authenticity of a system boot was intriguing. Life is better with Rust’s community automation Emily Dunham’s talk on community should be watched by all of our OSAS community leads and those of us working within Open Source communities. My Own "Call to ARM"
and then we closed the conference out until next year. Accessibility and Security Ever considered how disabled people can interact with security measures like captcha? Open Source Two-Way Radio I love David Rowe’s talks, especially where Open Hardware can enable underprivileged communities. Raspberry Pi Hacks Ruth Suehle had a total hardware failure just before presenting so had to wing a lot of this without her notes, and a copy of her slides from LCA 2014. And that is it until Linux.conf.au 2017 from 16-20 January in Hobart Tasmania. Each LCA is an opportunity to see what the early adopters are up to and perhaps predict future trends for the Enterprise. My first conferences were focused on configuration management (Puppet/Chef) and file systems (xfs vs ext vs btrfs). We then moved onto cloud technologies like OpenStack while last year had a lot of Container technology. Every year we see lots more on Open Hardware and IoT. I’m pleased to see that both Documentation and Community are increasingly important over the last two years with areas like DevOps and Security picking up momentum. I’ve had the privilege to speak at the mini-confs again this year and had some great feedback on ManageIQ from attendees who’d previously been unaware of the project, some of whom might become CloudForms customs in the future. Please excuse an errors/omissions. I’ve hopefully caught all of the sessions with Red Hat speakers or organizers. I’ll also try and update video links and add additional recommendations as I watch recordings. Also if you have a chance catch Brett James’s time-lapse video of the conference. 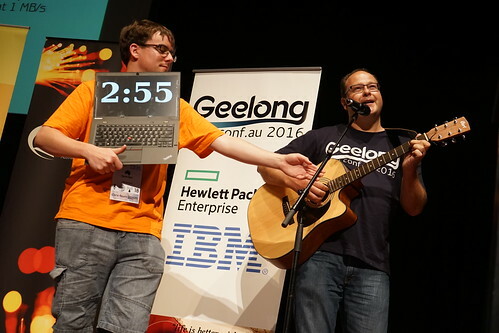 A huge thank you to the LCA 2016 team. After running LCA2015 in Auckland, I understand what a massive undertaking this volunteer-run event is and they did an amazing job.